I received an advanced reader’s copy of The Girls both from NetGalley and Penguin Random House for an honest review. I feel I should fully disclose that I have a slight obsession with cults and communes. This is an all around fascination with both fictional and factual accounts of life within these groups. There is something I find intriguing with the admiration of charismatic leaders and the sense of desperately wanting to belong and find identity. The above is partially why, The Girls by Emma Cline is thus far my favorite book of the year. Yes, we are only in June and something could beat it, but The Girls did way more for me than just the thrill of the Manson Family-eqsue subject matter. Cline’s words are beautiful. I love an author that can paint a scene, but with The Girls, I could taste the soggy end of a joint, feel the sticky heat, and smell molding wood of the house. What I loved about The Girls is that the story doesn’t so much focus on the charismatic leader, Russell, but rather is from the point of view of a woman, Evie. Evie spent much of the summer of 1969 at age fourteen on the ranch. We learn her story as she looks back to that time and her admiration for the girls in the group, and one girl in particular, Suzanne. Evie struggles through her parents’ divorce and the thought of the boarding school which waits for her once summer ends. All the while, she’s figuring out how to live in her changing body and use her newfound sexuality. It was interesting to see the pieces of the Manson Family that Cline peppered throughout the novel. We see the Charles Manson character in cult-leader, Russell. Mitch played a hybrid of musician Brian Wilson and producer Terry Melcher. Suzanne seemed to be Susan Atkins doppelganger even with a nod to her name. If you are at all interested in learning more about the time of the Manson Family, I highly suggest listening to the Charles Manson’s Hollywood series of the podcast, You Must Remember This. The Girls is an addition to the recent wave of debut novels that knock you off your feet. I cannot wait to see what Emma Cline comes out with next. She’s already been added to my auto-buy list. Even though I had received a copy of The Girls via NetGalley for review, I stood in line to get a signed copy at the Penguin Random House booth at BEA. That was solidly one of the best decisions I made at BEA! Pre-order or put The Girls on your hold list now for its June 14th release date. 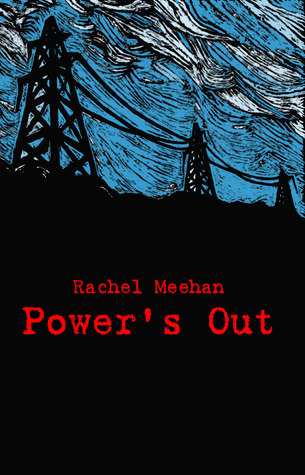 Power’s Out is the 2nd in the Troubled Times series by Rachel Meehan. I wasn’t nearly as engaged in this installment as I was with the first book, Water’s Edge. In Power’s Out we continue to follow Nairne’s struggle to survive in a world where climate change has caused extreme weather conditions and a crumbling of government infrastructure. Close to two years after she lost her own home, Nairne is on the road with Paul trying to stay alive and potentially find a place they could take up residence. When they come upon a group of folks who have created a settlement in an old convent, they try their hardest to show that they are worthy for a permanent place in the community. As money has become worthless, bartering and trades have become the way of life, and as we learn, this can be honest but there also comes the risk of dealing with deceitful criminals. Including ones that have returned from a past Nairne and Paul worked hard to leave behind. I wish I was more invested in these characters. The new ones that popped up were not as fleshed out as the characters in the first book. This made it hard to feel empathy for them. I also had trouble buying the motivation of the villain of the novel. In a world where it is becoming harder to survive, revenge doesn’t seem very plausible. Over at the Book Lust blog, Aarti put out the challenge to make our reading a More Diverse Universe or #Diversiverse for short. The only rule of #Diversiverse is to read ONE book by a person of color between October 4th and 17th, then write a review. That’s it. I invite you all to participate. 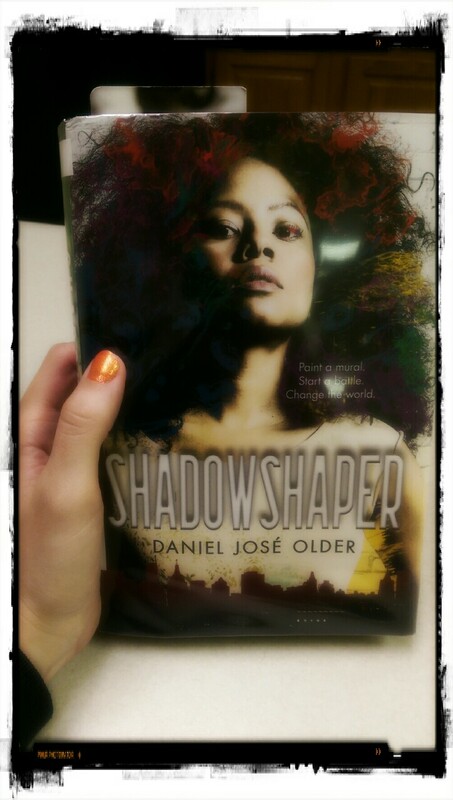 My pick for #Diversiverse was Shadowshaper by Daniel José Older. Originally, I had heard about this book from a Book Riot review, and moved it to the top of my TBR when I saw that the stars had aligned for my library to have my hold available during #Diversiverse. I am not usually a reader of magical realism or urban fantasy so I was excited to try something new. Shadowshaper is a look into the world of Sierra Santiago, a Puerto Rican girl living in Brooklyn. She’s an amazing artist who has been given the gift of Shadowshaping, that is bringing works of art to life through a connection with the spirit world. As she learns about what it means to be a Shadowshaper; she makes the connection that a group of Shadowshapers who hung out with her abuelo, before his stroke, are dying off one by one. Sierra teams up with her friends, including a potential romantic interest in fellow artist Robbie, to figure out what is happening and how she can put an end to it before they come for her. This is a great book dealing with so many issues; racism, sexism, cultural appropriation, etc all while we see Sierra come of age with her new found abilities. Older knows how to write about these issues in such realistic detail they were like a punch in the gut. Although as a white person, I could not directly relate to the both microaggressions and overt issues with race, I certainly recognized them and could feel the hurt. His writing of a couple of street harassment incidents, which I definitely have experienced as a woman, actually made me shiver. One of the overarching themes is cultural appropriation as we see what happens when a white, male professor intrudes into the traditions of the Shadowshapers. I highly recommend this book for anyone. It is marketed as Young Adult, but I feel there is so much folks of all ages can get out of reading Shadowshaper. Also, judge this book by its cover, because isn’t it absolutely beautiful?